The name Osprey is synonymous with hiking backpacks and has consistently delivered quality products in a saturated market. Since their founding in 1974, every piece of gear releases had undergone the relentless scrutiny of the owner and founder Mike Pfotenhauer. It’s no secret that Mike’s unwavering attention to detail has directly correlated to the sustained success of Osprey and their consistent success in the outdoor backpack marketplace. The Kestrel line of backpacks come in multiple sizes, with the 48 liter being one of the most popular. This backpack is a do it all backpack that offers a delicate balance of comfort and quality. Is the Osprey Kestrel 48 right for you? The Kestrel 48 is a lightweight backpack that works double duty as both an overnight pack and a multi-day hiking backpack. The backpack alone weighs 3.68 pounds and has a number of features that are typically only found on larger backpacks. With a sleeping pad compartment that’s separated from the main compartment and external sleeping pad straps, this backpack has everything you need for overnight adventures. The intuitive light aluminum wire frame transfers the load evenly leading to a comfortable carry for hours on end. The Osprey Kestrel 48 is loaded with intuitive and practical features that make it a popular choice among outdoor enthusiasts and backpackers everywhere. The main compartment is top-loading with buckles and compression straps that secure the lid. First, you release the buckles that hold the top cover of the lid in place and next you release the compression straps to access the main compartment. It does take a little bit of work to get into the top compartment, so utilizing the other pockets for things you need quick access to is a smart move. The biggest issue with top loading access is that it can be a pain to only have one access point. Osprey realizes the limitations of top loading style packs and included two zipper that runs the length of the compartment on the side for quick access. The sleeping bag compartment in the Kestrel 48 is a large pocket located at the bottom of the backpack. It opens and closes with a zipper on the bottom of the bag and there’s a removable divider if you want more room in the main compartment. The pocket itself is large enough to keep a sleeping bag along with a few other smaller items. It also gives the bottom of the bag a little extra cushioning on the bottom when it’s loaded. The Osprey Kestrel 48 comes with a lightweight AirScape™ suspension system. It’s built with a lightweight wired aluminum frame that has mesh covered backpanels. This gives it structure while maintaining flexibility and breathability. The EVA foam ridge on the backpanel with AirScape™ mesh provides suspension and good breathability so your back doesn’t get too wet. The shoulder straps are also padded with AirScape™ mesh and adequate padding to keep your shoulders comfortable under full load. On the right side of the pack is a long zipper that extends for the length of the pack. It’s another side pocket that you can put items lower volume items, things like a first aid kit and extra water filters fit well. On both sides of the pack there are 2 large pockets made with stretchy material for a water bottle or backpacking pillow. The pockets are about 12 inches long from the starting at the bottom of the bag, so you can easily fit a large water bottle or trekking poles. The front of the pack has a large stretchy mesh pocket that covers the front portion of the backpack. It’s a perfect place to store an extra layer of clothing or any other items that you need quick access to. There’s a trekking pole or tool loop on the bottom of the pack just beneath the mesh pocket. On the front face there’s a tucked away bungee tie-off for keeping tools or poles and when you don’t need it, it easily tucks into a small pocket. In total, there are 8 different external compression straps located on various places on the Kestrel 48. The two main compression straps are reverse straight jacket compression straps that can cinch the load down when needed. They can also be reversed to the front of the pack, giving you the freedom to use them as you please. The sleeping bag compartment has 2 smaller straps that you can use to get your sleeping bag to take up as little space as possible. On both the top and bottom each side of the pack, there are a total of 4 compression straps (2 on each side) for strapping any taller gear you need to store on the sides. On the back panel section of the pack, there is an hydration compatible system with a little water symbol. Behind the shoulder harness, not in the pack body, there is an external sleeve for placing a hydration bladder. There isn’t a hydration system included in the pack, however, you can include one and use it with the Kestrel 48. The Osprey Kestrel 48 it a do it all hiking backpack that performs great as an overnight pack or a multi day hiking backpack. It’s a versatile backpack that has everything you need for a long distance hike as long as your willing to make the most out of the space you have. 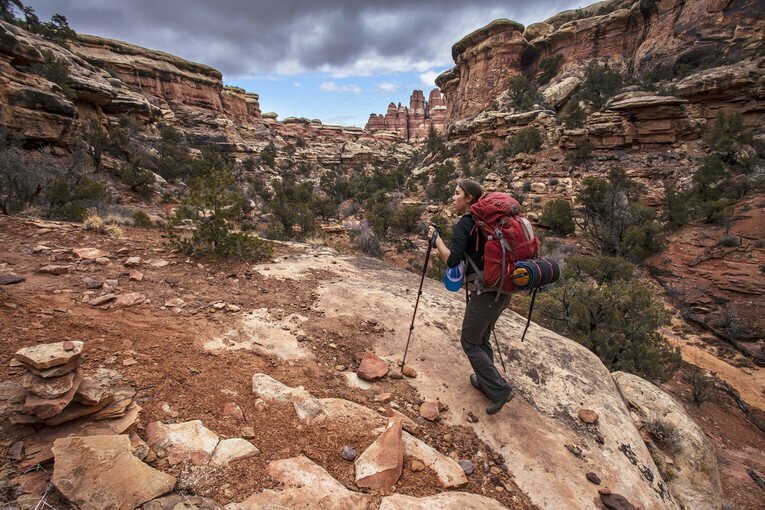 The lightweight AirScape™ suspension system is designed to give the pack structure while maintaining flexibility, breathability and moisture management. The EVA mesh padding is comfortable against your back and shoulder, meanwhile, giving you a comfortable carry. Overall, this backpack is lightweight and well built. With the adjustable torso length and smaller volume this pack works for all sizes of outdoor adventurers. As always, get lost and keep wandering.